Exactly one year ago I passed my direct access test, and what a year it has been. 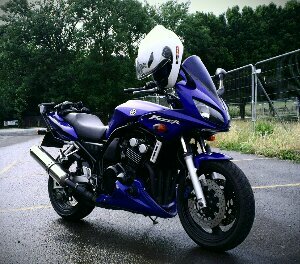 Thrown in at the deep end, straight onto my Fazer 600 and commuting into central London everyday, then onto some long ride outs like my jaunt up to Shrewsbury. I’ve put in 7000 miles odd, numerous sorties to the Ace Cafe and unfortunately a couple of offs. I’m definitely a better rider than one year ago, far more confident and a dab hand at filtering. It’s inevitable all new riders will drop their first bike a few times, maybe an un-faired bike would have made this less painful on the wallet, but hey-ho, I’m loving my Fazer. Moving on, I definitely need to get out on more rural and twisty roads, my skills are too one sided to city riding. Goals for the coming year are: completing an IAM advanced riding course and getting more involved with the maintenance side of bikes. So a big thanks to all who supported me and this blog along the way – ride safe people!